The former Magpies centre-back left St James’s Park to join Wolves in January 2016 but his fondness for the club is clear to see. Williamson described the North East as “home” after returning to the region to sign a one-year deal with Gateshead last week. His focus is now on helping Steve Watson’s side continue their impressive start to the National League season and made his debut in Saturday’s 2-1 home win against Dover Athletic. That win was secured on the same afternoon that Newcastle opened up their Premier League campaign with a narrow home defeat to Spurs after a summer of transfer turmoil on Tyneside. The 34-year-old still keeps an eye on his former club and expressed his hope that supporters are given the club he feels they deserves. “It is difficult to say what is going on now that you are not on the inside and even when you were you never really knew what was going on,” explained Williamson. “It’s a fantastic club and the fans deserve some direction because they follow the club everywhere. “They have got a fantastic manager in Rafa Benitez and a good squad. Williamson departed from St James Park just weeks before Rafa Benitez replaced Steve McClaren in the St James’s Park hotseat. 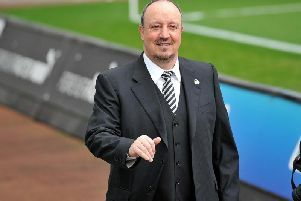 “Given the chance, Benitez can take the club forward,” Williamson added. “You look at where he has been, he’s had an exceptional career and he has all of the credentials. “He is one of the best managers that has been at the club.